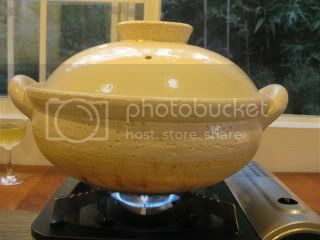 My donabe steamer, "Mushi Nabe", makes steaming dinner so fun. We cook everything at the dining table. 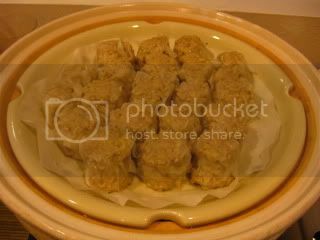 One of the dishes I like to steam in my donabe is Pork Shumai. Here's the basic recipe. For very juicy-style, you need ground pork with good fat content (marbled meat). But, there is a wonderful alternative for much leaner-style with full of flavor and juiciness. 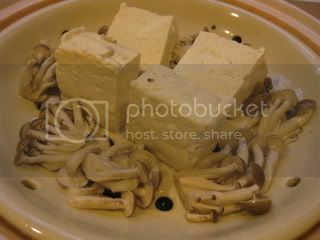 In the recipe, you can simply substitute the dry shiitake mushrooms with a small package (3 oz) of enoki mushrooms (or use both). You can just mince and add the enoki mushrooms to the mixture. Use leaner ground pork (about 3/4 pound) instead of marbled kind. Replace the lard with 1 teaspoon of sesame oil. My lighter version shumai is so juicy and fluffy. Simply delicious. I also steamed some homemade tofu. 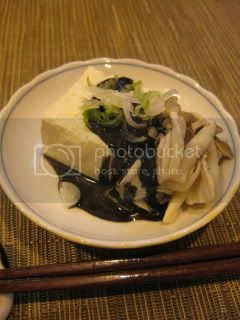 A couple of pieces got tipped over during steaming, but the flavor was as great as always:-) Here's the simple steam-tofu recipe.